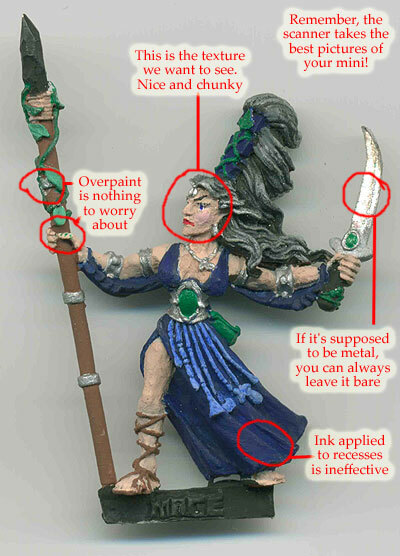 The purpose of this article is to thoroughly explore the techniques and methods used to paint a miniature that will achieve a consistent 4.0 rating or less on CoolMiniOrNot.com. Less is more, right? As with anything in life, preparation is key. You have to have the right mini, brushes, paints, and environment to consistently achieve the results described above. First, the paints. Buy any paints you like, but make sure they're good and thick. Inexpensive paints work well for this purpose, but really any paint can accomplish the goal. Never mind if the paint is starting to dry out or looks gritty. That will actually assist us in our endeavors. Just remember, it's only paint. Your varnish should be high-gloss or you shouldn't use it at all. Apply it thickly when you're finished-you don't want your work to chip during gameplay or in transit. Next, the brushes. They should be inexpensive, since you're already out of pocket on everything else. The brushes that come with children's watercolor sets are rather ham-handed, but effective. The inexpensive natural and synthetic brushes from the craft store will also work well, with slightly more finesse. Brushes with very thin stems will assist that shaky-hand look that is so effective for the 4.0 model. The mini. The mini should have plenty of flash and apparent casting problems, with heavy mould marks as well. You can use the mini right out of the box, or you can modify it by adding or removing parts and accessories as needed. Do make sure you attach everything carefully with elmer's glue, school paste, or caulk. If you attempt to correct any miscasting, flash, or mould marks, do so with a nice big set of clippers or a coarse file. Remember, roughness here will only improve your result and increase your chances of achieving that consistent 4.0 or less. Washing the mini before painting is unnecessary, even if you and some pizza-munching friends have been passing it around, checking out the details. The environment. You should set aside a place to work on your minis. You should definitely be concerned with the heating and cooling. Your table should be right beneath a heating/cooling duct, so that it will keep you comfortable during your painting time. 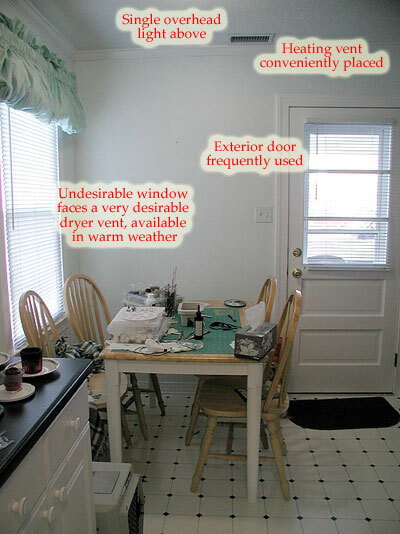 If you can somehow contrive the dryer vent to expel lint in your general vicinity, that will help also. Your painting table should be near an exterior door, preferably the one your spouse or other family members use frequently without warning. And for lighting, remember that all paint colors look best in incandescent light. Let's remember that your favorite pet will surely be interested in what you're doing, and you should welcome them to your crafting area. They'll want to drink from the water dish you're using for your brushes, and their presence will no doubt promote a general feeling of calm and comfort. Also, keep your pebbles, sand, static grass, and other finishing items near you while you're painting, preferably in open containers or in small piles on the table. Having prepared an area, the mini, and your tools, it's time to paint. 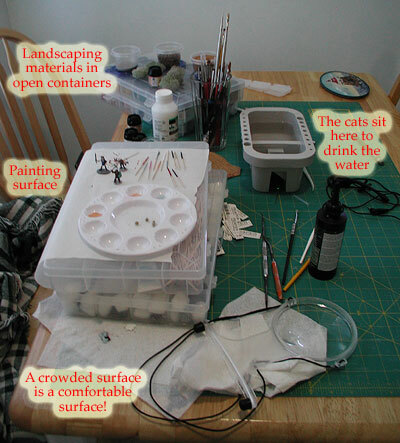 So you're sitting at the table, mini in hand, with your paints, water, brushes, sand, grass, and pets arrayed around you. Go for it! Grab a color and a brush and have at it. No priming is needed-the mould release powder on the mini actually acts as a primer! When choosing colors, start with the color you want to end up with--shading and highlighting are highly overrated. And wet-blending is such overkill. These are minis, not art. If you absolutely must, use full-strength ink right from the bottle. 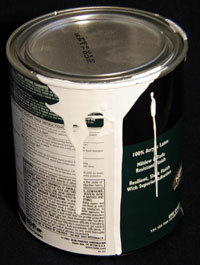 When you apply the paint, use it full strength from the container. You want one-coat coverage, and if you thin it with water or acrylic medium, you'll just have to go over it again. Between using the paint full-strength, sitting under the heating vent, near the dryer and the pets, you'll achieve the proper texture with your paint. 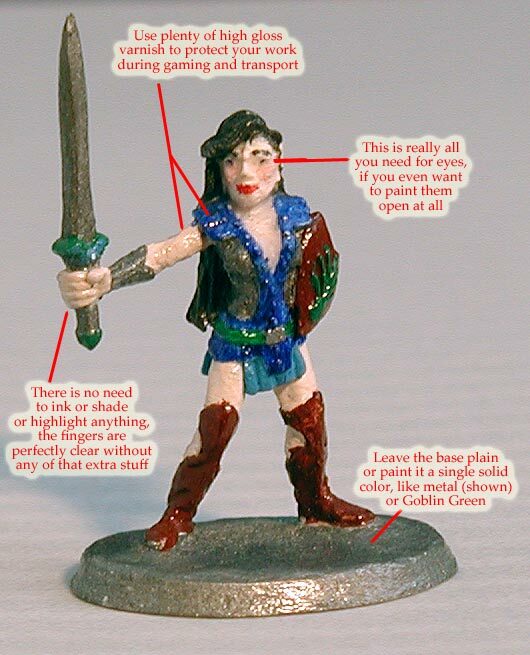 Having chosen your mini properly, there won't be a whole lot of fine details to worry about while you're painting. So it should just be a matter of slapping on the paint as quickly as possible. But if you do run into a detail you actually want to paint, use a size 0 brush well-loaded with paint to pick it out. And if you happen to hit another part of the mini instead of what you intended, don't worry. Nobody will see it. Anyway, the textures in the mould are only there as suggestions, so if you don't like something, just paint it out. If your mini has eyeballs showing, never mind. Just paint it skin color and tell everyone the eyes are closed. Or, if it suits the model, you can paint the eyeballs white and tell folks the character is blind with heavy cataracts. Red is even better, since everyone knows that evil characters and creatures always have red eyeballs. Toenails, feet, shoes, and the hems of dresses should always be exactly the same color as the rest of the skin/garment. That whole thing about "realism" is just an excuse to give a bad score to a mini someone doesn't like. So what if the mini is slogging through the mud and his shoes are spotless? So what if the troll has clean toenails? So what if the hem of the dress is dragging on the ground and the undead's armor is shiny and new? That's what magic is for, right? To keep everyone's feet and clothes clean. That is especially true for fighters with weapons. It makes perfect sense for the weapon to be absolutely soaked in blood, while the wielder stays spotlessly clean. After all, the wound is an arm's length away from the wielder. Again, varnish should be high-gloss and applied thickly for protection. The shine is a nice touch and gives any mini a little bit of class. So you've finished the paint job to your satisfaction. It should only have taken an hour or so, tops. Now lets finish the mini. If you're lucky, the base was moulded onto the figure itself, and you've been painting it all along. If that's the case, you're already done! If your mini didn't come pre-based, though, you'll have to put it on the base. The best base treatment, of course, is no treatment at all. Just glue the pieces together. Or you can paint it a nice, bright Goblin Green (to represent grass, of course) and call it done. Those folks who scour the landscape for cool rocks or hunks of wood to use are out of their minds. If you absolutely have to put something else on the base with the mini, grab some of that cheap flock or even some dirt from the driveway and glue that up. The natural color of whatever you use is the best. You could, of course, arrange several minis together in a diorama, but then you'd be in danger of exceeding the goal of a 4.0. If you must, though, make sure you choose several unrelated characters, suitably painted, in a diorama that shows them standing around in a field, talking. Of course, you can't achieve your goal of a 4.0 without actually posting a photo on CoolMiniOrNot.com, so the next section covers the photography and posting. Single figures should be scanned using a flatbed scanner. Do also guide the mini with your fingers so they also show up in the photo. Make sure you save the photo with about 60dpi resolution, and the scanned picture should be giant sized so everyone can get a good look at the colors. If you haven't got a scanner, then a webcam will also work. That camera, though, will be better served for the blurry, distant photo. Make sure the blurring doesn't actually improve the look of your paint job, though. Lighting should be quite yellow from incandescents, and the photo can be taken with just the overhead light. Alternatively, get the brightest lights you can find and make sure the glossy varnish reflects all that light directly into the camera lens. If you have any ability to resize or retouch the resulting .jpg, don't. Leave all the white space around the mini, leave the colors the way they show up. Only resize or retouch if you have to in order to get the .jpg below the 100K 600pixel restriction, and then do just enough to get it to fit. When you post your photo online, be sure to title it "another mini" even if you know the name of the mini. Nobody uses the search feature anyway. Also, be sure to point out all of the little problems you saw in the mini so that others are alerted to them and can examine them also. A few folks may comment and say, "no, really, that's great!" But the vast majority will read your comments and instantly agree, thus ensuring you reach your target score. Don't forget to vote on your mini yourself as you post it. If you suggest a 3.0 score, the first few voters will surely agree. If you say it's your first mini, folks may give you a more lenient score, so you should say you've been painting for three or four years now, and that the posted mini is your best yet. It was my intention in this article to set out the specific steps required to produce a skillfully done 4.0 model. Anyone may follow these steps and be assured of achieving the same result. I hope you find these instructions illuminating, and can use them to your benefit. From the Browse feature of CoolMiniOrNot.com, you can search for minis with scores between 3 and 4 to view illustrations of various techniques set forth in this article, including an early effort of mine. If you got this far and didn't realize that this is completely tongue-in-cheek, please rest assured that I'm not an idiot and this is just for fun.